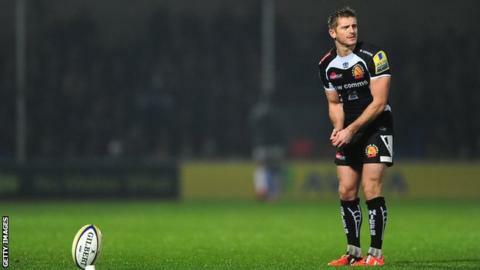 Exeter backs coach Ali Hepher has hailed fly-half Gareth Steenson after his nine penalties guided the Chiefs to a 27-19 win over Saracens. "There's no-one else you'd rather be kicking those," Hepher told BBC Devon. "He's meticulous in his preparation and the work he puts in throughout the week is great." Exeter are third in the Premiership and the victory moved them seven points ahead of Saracens who are fourth. "Under that sort of pressure he holds it together well," Hepher continued. "It gives the team fantastic confidence that, if they get in the right areas and start to squeeze sides, they'll get penalties and we'll take points from it." Hepher says Exeter's pack have also been instrumental in their recent good run, which has seen them win their last six games in all competitions. "They set it up right up front, (forwards coach), Rob Hunter's done a fantastic job with those boys and we're coming strong in that area," he added. "What we're becoming is a really smart side but with a steely undertone. "The guys are performing week in, week out and putting in some really grounded, solid displays, so it allows you to be competitive in all games and we've come away with some good wins. "But we've got to knuckle down, we're not the finished product by any means."